NO NO NO NO NO NO NO just because something is considered a high heel, doesn't mean it looks good, especially when the heel fans out to be flat at the bottom. this is really not something you want to purchase, these are ugly, they are basically a man boot with a heel attached. NO. These boots are my favorite boots in the world. 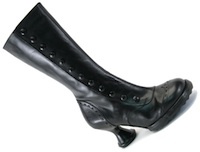 They have enough of a heel to provide a nice lift, but the heel is thick enough that the boot is very stable. I had knee surgery a few years back, and these boots do not leave my knee sore like some heels do. The leather is very soft and supple, and takes very little time to break in. They are reasonably comfortable, I can wear them easily for a night of clubbing without my feet hurting. They tend to run slightly small, so be sure to order a half size above what you normally would. They are a bit pricey, but i found them to be completely worth the cost.